The programme is aimed to respond to challenges of the recent European Marine Strategy Framework Directives. A pivotal goal of the Programme is to promote international and European cultural exchange and interactions among students. 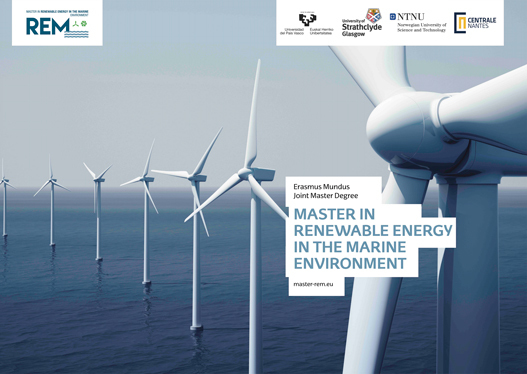 For this purpose it was conducted a feasibility study regarding the convenience of the implementation of such a Master in the Basque Country context by an independent office EURO PRAXIS commissioned by UPV/EHU which has taken into account: a) analysis of demand: company needs, b) analysis of offer: identification of programmes and offshore energy agents, c) pre-proposal Master contents: analysis of contents, structures, typologies and contrast with companies and stakeholders. Six content priorities and three segment priorities were identified. The analysis of offer helped to identify relevant core partners in order to complement skills and capacities for structuring a Master excellence programme. The Master degree submitted to co-design with partners has been carried out taking into account the needs and priorities mentioned by consulted companies.